This is a little money maker. Charge your customers $10.00 to put round corners on their business cards then in no time after 16 jobs its all profit every time you put round corners on cards. It only takes a few minutes to do 500 cards. Easy to set up and run, the CV7 Automatic Folder is the perfect value for church, school, business or other organizations. This tireless tabletop folding classic will serve the low volume user who does not need the capacity of a larger Martin Yale folder. The CV7 low-cost, high-quality folder is UL and CSA approved. Remember to order (separately), Rubber Roller Cleaner/Rejuvenator and Static Eliminator for simple routine maintenance and smooth operation. To complete your economical and streamlined folding center, order the Martin Yale Model 400 Jogger to smooth edges, fluff paper and help eliminate static electricity. A jogger is a basic necessity for efficient paper handling. The best value among joggers is the Martin Yale 400. It fluffs paper, dissipates static electricity and aligns the edges for efficient folding. It jogs a full ream of 8-1/2"x11" paper or one half ream of 11"x 17". The 4OO jogger features isolation-mounted eccentric weight movement and self-aligning, oil-impregnated bearings. Additional features like a hardwood and steel basket and high-impact one-piece shell make the 400 jogger another example of Martin Yale quality, performance and value. For really heavy cutting jobs, the Martin Yale 7000E Commercial Quality Cutter easily cuts a stack (of 24# bond paper) up to 12 inches long and 1-1/2 inches thick in one easy stroke. The exclusive parallel-action clamp ensures positive lock-down of narrow sheets and the integral safety latch keeps fingers away from the blade. The blade changes in just minutes and maintenance are minimal and easy. The Martin Yale 959 Air-Feed Automatic Folder is loaded with quality, value and state of the art folding technology. It is appropriately known as the "Printer’s Folder". 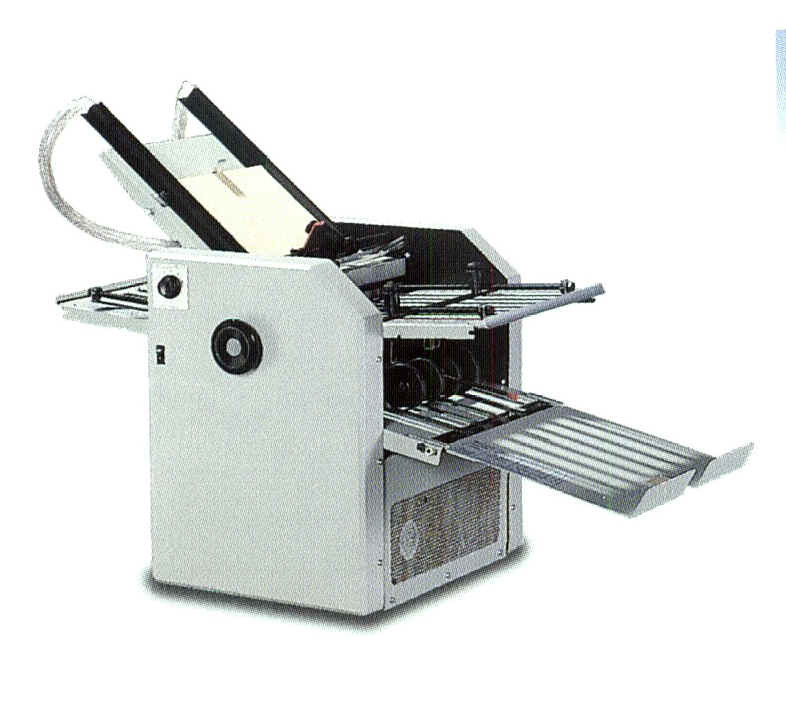 Smooth bottom- feeding eliminates the need for fanning and allows continuous loading without stopping the folder or reversing pre-numbered stock. Even coated stock feeds easily and without the smudging sometimes associated with friction feeding. High speed folding jobs can be completed quickly and efficiently with the 959 at speeds variable up to 18,000 sheets per hour. An easy to use solid state speed control is conveniently located on the side of the unit. Single, letter, "Z" double-parallel and variations can be one-pass folded and French and baronial folds can be made in two quick passes. 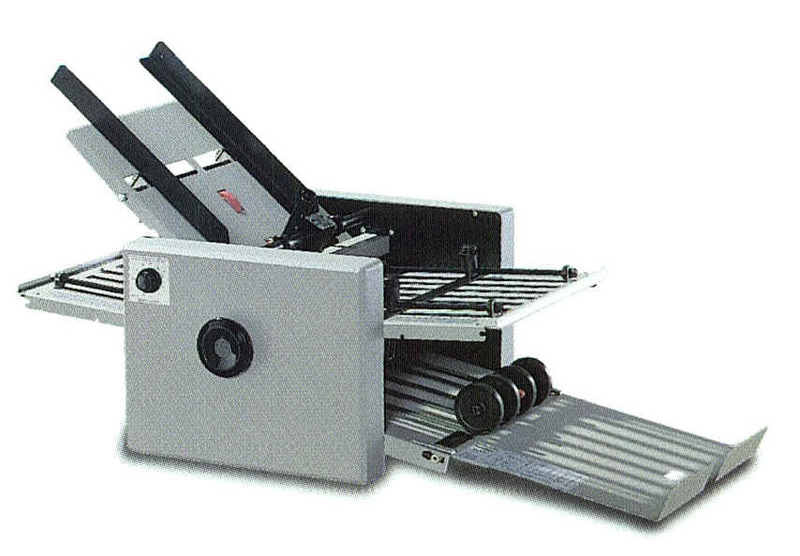 The F81A is the perfect solution for any school, church or business which demands quick and easy set-up -Pre-programmed for six popular folds: Half, standard letter, accordion, double parallel, half accordion and brochure. Voltage 110V Weight 65 lbs. Paper Size up to 11" x 17"
Heavy Duty Bench Model. Designed with smooth rigid cutting action for hard-to-do jobs. Accepts full range of interchangeable cutting units (1/16" to 1 1/2" radii) with a maximum cutting depth of 1/2". Perfect for quick printers and mail rooms. Jogs a full ream of standard copy paper. Table size: 4" W x 13" H Ideal for checks and envelopes also.